Outside it was bright and beautiful, a perfect summer weekend, but last Saturday at least a couple of hundred people stayed inside to watch other people make coffee. 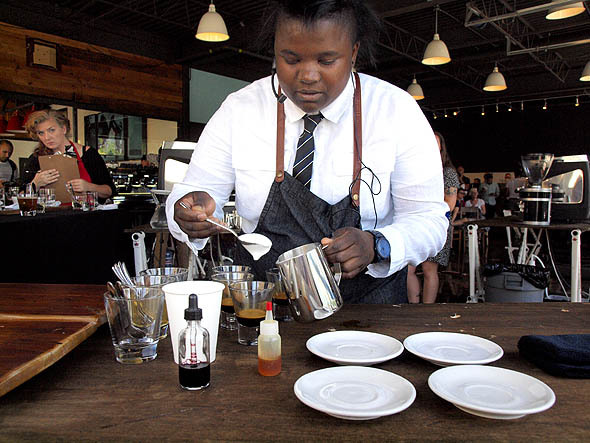 Saturday was day two of the Central Canadian Barista Championships and the cupping room and event space at Propeller Coffee's new storefront were full of coffee fanatics. 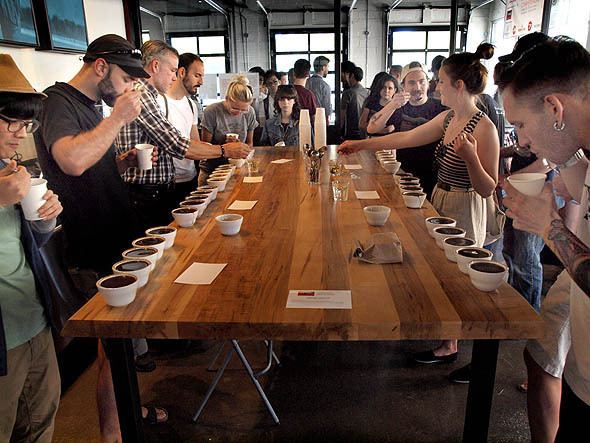 Besides the public's apparently unquenchable thirst for specialty coffee, it's events like this, a regional leg in a national coffee-making competition, that drives the constant expansion of the indie coffee market, as roasters and coffee shops challenge their employees to maintain their creativity and hold each other to high standards. 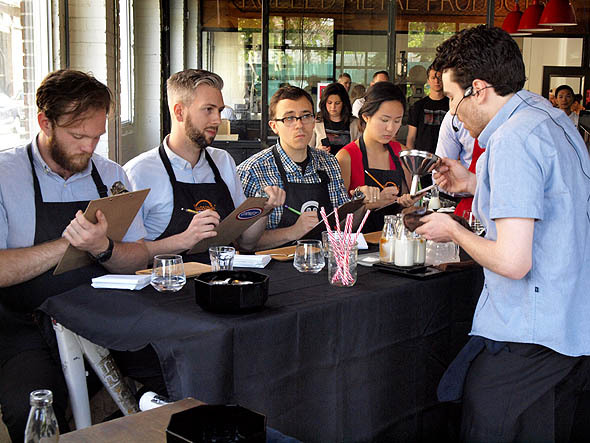 The format is simple enough: Each barista competitor has a fixed amount of time to showcase their skills in front of a panel of judges, four of which are "sensory" - concerned with the taste and presentation of each drink - while two others are "technical," and hover around the barista with clipboards, scrutinizing their setup and skill. There's a fair amount of showbiz involved in the contest; baristas will dress the judges table with tablecloths, and no one starts the timer to begin their presentation until the DJ has cued up their presentation music. Competitors have a fixed amount of time to describe the creative process that led to their drink, a spiel that they'll accessorize with sensory aids to accentuate flavours or aromas in the drink. They also have to prove their basic barista skills by pulling an espresso and presenting a cappuccino complete with foam art while they talk. Over the half dozen presentations I watched on Saturday afternoon I saw coconut milk and peaches, honey and berries and marshmallow among the ingredients used. 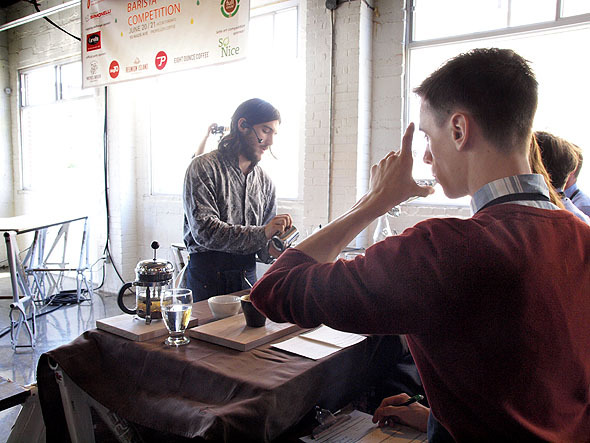 Baristas from all over Southern Ontario competed in the two days of judging, from local favorites like Sam James, Lit, Crema, Jimmy's and Snakes & Lattes, and indie shops in Orangeville, Guelph and Kitchener. 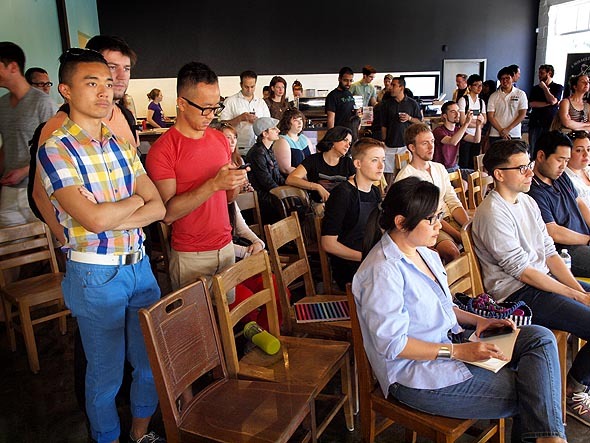 For all of them, the championship was clearly a big deal, as they radiated nerves while they set up and waited their turn with each panel of judges while Michael Potters from Parachute Coffee emceed. During lulls in the action, the public could move to Propeller's cupping room, where samples of different roasts could be appreciated to a loud chorus of slurps, and the long bar in the main room had meat pies from Kanga and beer from Nickel Brook Brewery. And while the periphery of the room was full of people from the city's coffee business network, the chairs up front were filled with friends and family of contestants as well as the curious public who obviously thought there'd still be plenty of sun to enjoy while they watched the aproned competitors work their Zuccarini-supplied machines. In the end, it was Chris Tellez from one-man roaster and coffee evangelist Working Coffee who took first place, alongside three other baristas who'll head off to represent this part of the country in the national championship at the International Centre this September - an event worth remembering if you're one of an apparently growing number for whom coffee is more than just a drink.